There is a humane, transparent, truthful -- and constitutional -- way to address illegal immigration. Unfortunately, President Obama's unilateral plan to exempt millions of residents from federal immigration law is none of those things. Obama said he had to move now because of a dawdling Congress. He forgot to mention that there were Democratic majorities in Congress in 2009 and 2010, yet he did nothing, in fear of punishment at the polls. Nor did Obama push amnesty in 2011 or 2012, afraid of hurting his own re-election chances. Worries over sabotaging Democratic chances in the 2014 midterms explain his inaction from 2012 until now. He certainly wouldn't have waited until 2015 to act, because Republicans will then control Congress. Given that he has no more elections and can claim no lasting achievements, Obama now sees amnesty as his last desperate chance at establishing some sort of legacy. Obama cited empathy for undocumented immigrants. But he expressed no such worry about the hundreds of thousands of applicants who wait for years in line rather than simply illegally cross the border. Any would-be immigrant would have been far wiser to have broken rather than abided by federal laws. Citizens who knowingly offer false information on federal affidavits or provide false Social Security numbers would not receive the sort of amnesties likely to be given to undocumented immigrants. Obama has downplayed Americans' worries about social costs and competition for jobs, but studies show illegal immigration has depressed the wages of entry-level American workers while making social services costly for states and burdensome for U.S. citizens. Obama says he has the legal authority to rewrite immigration law without working with Congress. Yet on more than 20 occasions when it was politically inexpedient to grant amnesties, Obama insisted that he would not -- or that such a move was prohibited by the Constitution. Obama not long ago warned us about the dangers of granting amnesties by fiat. "The problem is that I'm the president of the United States, I'm not the emperor of the United States," he said. On another occasion, he lamented, "Believe me, the idea of doing things on my own is very tempting. ... But that's not how our system works. That's not how our democracy functions. That's not how our Constitution is written." By setting aside settled immigration policy and ignoring statutes he finds inconvenient, Obama has set a new precedent that a president can arbitrarily declare what is valid and what is not valid not immigration law. Should his successors make up their own versions of any federal statutes they choose, in areas ranging from abortion and gun control to drug enforcement and environmental protection? Obama claims he has the legal authority to grant amnesty because Ronald Reagan and George H.W. Bush did it. But again, Obama predictably misleads. Both of those presidents worked with Congress to ensure that new immigration legislation would not split apart families. The amnesties they granted were in accordance with the Immigration Reform and Control Act of 1986 and had only a fraction of the impact that Obama's executive order would have. More importantly, even those congressionally sanctioned and narrow amnesties were largely seen as failures. Past non-enforcement of immigration law helped lead to the explosion in illegal immigration of recent years. Obama says Congress is stalling. But his characterization of congressional inaction simply means that the Congress does not wish to pass Obama's version of immigration reform. In 2015, if the Republican Congress submits an immigration bill to Obama, he will likely veto it. Would he then term his own opposition "obstructionism"? Obama has claimed that under his administration, deportations have increased. That, too, is untrue. The fraudulent statistics used to make this claim redefine how deportation is measured -- in much the same manner that other federal statistics like unemployment rates and GDP growth were recalibrated for partisan purposes. Under Obama, Mexican citizens who are apprehended after crossing the border and returned to Mexico are classified as having been deported. 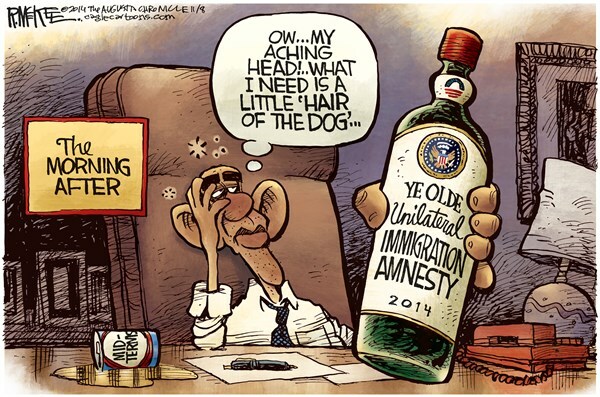 Obama carefully omitted key details about qualifications for amnesty. He cited a criminal background check, but does that mean immigrants convicted of crimes such as driving under the influence or other serious misdemeanors will be deported? What about filing false federal affidavits or Social Security numbers -- crimes that are usually felonies? The president suggested that all undocumented immigrants are here to work. Most are. But recent statistics still suggest that almost 40 percent of undocumented immigrants rely on some sort of state or federal welfare assistance. Obama will immediately reward millions of undocumented immigrants with exemption from immigration law. But does that mean those who do not qualify -- those who committed felonies or serious misdemeanors, who have no sustained record of work, or who have been in the United States for only a year or two -- will now face deportation that is as rapidly applied as amnesty? Because Obama has serially misled the American people on key issues such as Obamacare, the Benghazi attacks and his own prior constitutional inability to grant amnesty, there is no reason to believe him on the details of his new immigration move. Assume instead that Obama sees his executive order simply as a first step in a continual unilateral effort to dismantle immigration law that he finds incompatible with his own larger agenda. For Obama, federal law is inconvenient -- and therefore irrelevant.